Formulated with organic argan oil and proteins, Chaacoca restores natural moisture level with a rich thick lather and detangles as it cleanses. Gentle enough for daily use. Chaacoca daily moisture/repair conditioner is an exceptionally rich lightweight formula infused with organic argan oil that provides outstanding smoothness and hydration. This moisture-balanced conditioner leaves hair healthy, smooth, silky, and manageable with renewed volume and brilliance. 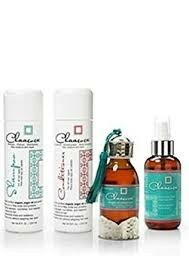 Chaacoca Shine Finishing Mist is made with 100% certified organic Moroccan argan oil. Their humidity-resistant formula protects hair against the harshest elements and instantly smoothes flyaways, provides a lustrous incredible shine, and enhances hair color. Massage into wet hair until a rich lather is achieved, then rinse. After shampooing, massage evenly into wet hair. Gently comb through and leave in for 1-2 minutes. Rinse well. Spray Chaacoca shine finishing mist lightly and evenly from about 10 inches onto dry hair for an instant shine and smooth finish. Purified water, disodium laureth sulfosuccinate, sodium c14-c16 olefin sulfonate, cocamidopropyl betaine, lauramide dea, glycerine, glycol distearate, sorbitol, polyquaternium 7, polyquaternium 10, argania spinosa kernel oil, hydrolized keratin, sodium chloride, phenoxy ethanol, panthenol, hydroxypropyltrimonium chloride, potasium sorbate, edta, fragrance, yellow #5, red #33. Purified water, cetyl alcohol, argania spinosa kernel oil, simmondsia chinensis (jojoba oil), cetrimonium chloride, glycol distearate, glycerine, hydrolized keratin, polyquaternium 7, polyquaternium 10, behentrimonium methosulfate, cetearyl alcohol, cyclomethicone, dimethycone, hydroxypropyltrimonium chloride, c12-c13 pareth-23, panthenol, ethylhexylglycerin, phenoxyethanol, edta, fragrance, yellow #5, red #33.